UA Little Rock endeavors to make commencement barrier-free. Please read below to see how accessibility is being addressed. If you have any questions or other requests, please contact the Disability Resource Center at 501.569.3143. Accessible entrances to the Jack Stephens Center are at the southwest entrance, and the east entrance past the stairs. Sign language interpreters will be on the big screen on each end of the arena. Large print programs will be available at the southwest entrance at the accessibility table. Graduates who are wheelchair users, please speak with the Disability Resource Center so we can remove enough chairs on the floor to make plenty of room for you. Anyone wanting a sighted guide should also contact the DRC with plenty of notice. There are many seats available on the mezzanine level that do not require walking up or down any steps, as well as plenty of spaces for wheelchair users. They will be marked. For anyone needing those spaces, please go to the accessibility desk located at the southwest entrance. Please feel free to have one family member or friend accompany you, but ask the rest of your group to sit elsewhere in order to preserve accessible seating for others who need it. 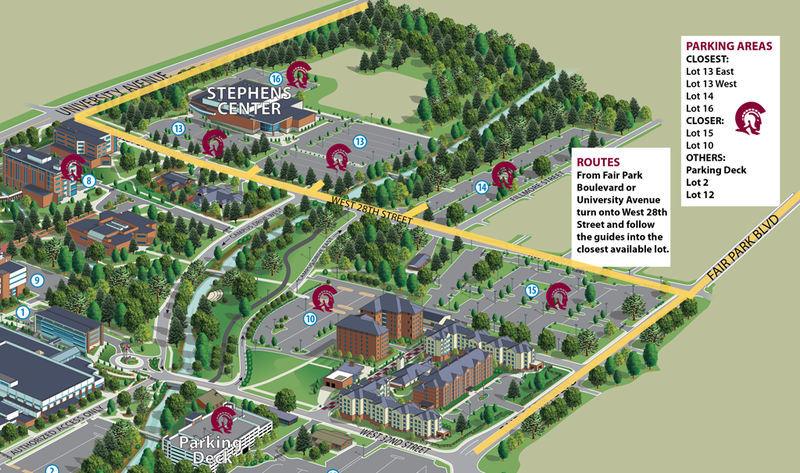 Information about parking and using Trojan Transit is available at this link.